become synonymous during this happy time. during the summer months, but it is during winter that the greatest number of proposals is made. drama to your proposal. Here are some of the ways you can pop that life-changing question. decorations come in. Ask her what that lone ornament is so she will look at it. You can spell out the phrase “Will you marry me” by hanging the letters on the garlands around the tree. Remove the star or angel at the top of the tree and position your ring in a big, glittery box in its place. to make sure your ring won’t be overlooked. Ask a baker to create a cake designed like a small Christmas tree decorated with gold and silver wedding rings. 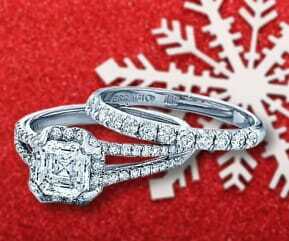 Ask the baker to make your engagement ring the topper of your special Christmas tree. Most people have fond memories of Santa, and you can build on this to create a special setting when you propose. little jewelry box right from your pocket. Another scenario could have her sitting with Santa, who would of course give her a very special gift. bended knee, or ask her to sit on your lap. man who really wants to ask his girlfriend to be his wife in a most memorable way. park attendants to light up your lights when you give the signal. consist of a series of stations with hints, and end with your ring ensconced in a nest of lights. interesting ways to use desserts as receptacles for diamond rings. Here are some of those delicious ways. 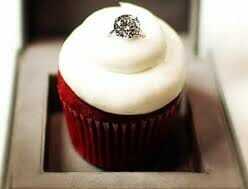 If she thinks cupcakes are a piece of heaven, have one made just for her and stick your ring in it. engagement ring firmly in the middle of the plump beauties. for her – one that has a ring on top instead of a cherry. Give her a bouquet made of cookies and allow the goodies to ask her the same question. remember for the rest of your days. enough to hold you comfortably, try asking stores selling refrigerators if they can space you one. This is not a new trick, but it always works. Wrap your gift in a box within several other boxes. hint about what the final box will contain. to see the lights, and say something tacky like, “Boy, Those lights certainly look like fancy diamond rings. can greet the coming New Year as an engaged couple.